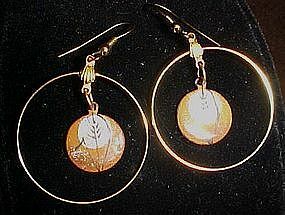 Gold tone hoop earrings measure 1 1/4" in diameter and have matching gold tone pierced ear wires. Center is an enamel over copper center piece which has a hand painted plant as the decoration. Excellent like new condition.